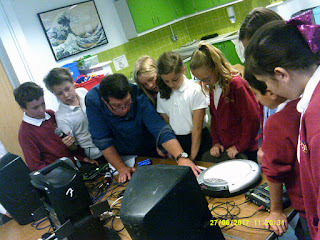 Yesterday, the Year 5 children had a lovely treat when Readipop came into school with their music technology equipment. The children formed an “urban orchestra” to create their own music. They particularly enjoyed the voice changer which changed the pitch and qualities of their voice and the different drum machines. They were taught how to make a graphic score to record their ideas. Thank you to Jex and Eliza’s dad for organising. Jack said this was brilliant. Thank you.